Attorney General Ibrahim Riffath, on Thursday, declared on Twitter that the 'Legal Professions Bill' will be amended so that lawyers who are already authorized to advocate in a court of law will continue to retain their licence. The Attorney General announced the amendment after lawyers expressed discontentment with the bill in its current state. According to the bill, some lawyers have a risk of losing their licenses in three years time, if the legal practitioners are not able to complete a degree within the period. The bill in its present form states that those with a sole degree in Islamic Sharia law will have to complete a degree in law within a period of three years in order to retain their ability to practice. 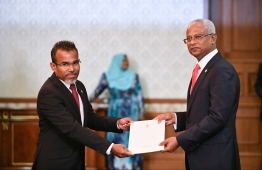 Parliamentarian of North Maafannu constituency, Imthiyaz Fahmy who submitted the bill to parliament, stated that the bar association was intended to prevent unfair disciplinary action against lawyers. As such the bar association will be responsible for guaranteeing rights and privileges to all Maldivian lawyers. In addition to this, the bar association will issue licences, designate specialisations, and monitor the work of local lawyers. It will also set standards for legal trainings. Notably, the bar association have the right to take disciplinary measures against lawyers who act in violation of the code of ethics. While the constitution also accords this right to the courts, several lawyers have been suspended from legal practice in the past. The bar association will consist of a seven-member executive committee and five subcommittees.